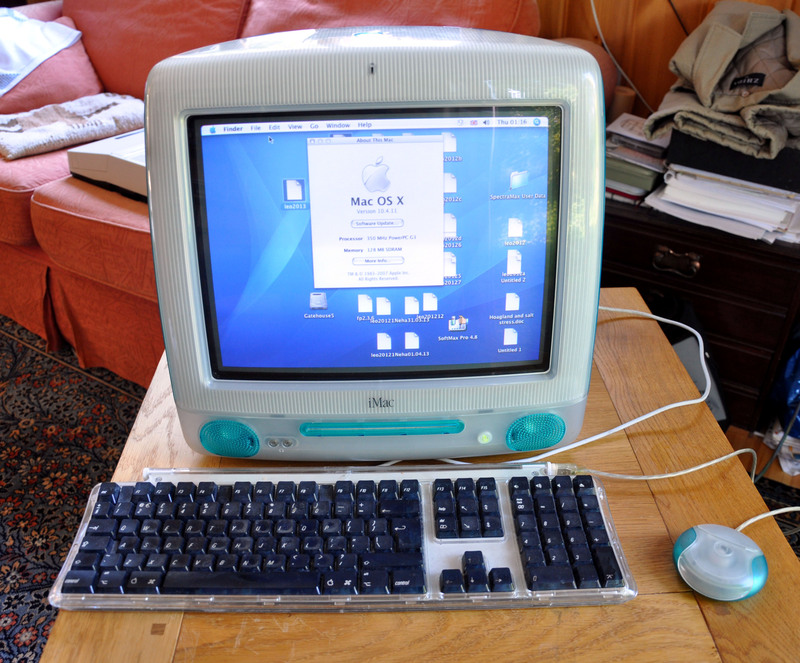 There information about the iMac G3 here. Our model here is the Revision B Model. This is an Apple iMac G3. It has a fullsize keyboard and roller ball mouse. 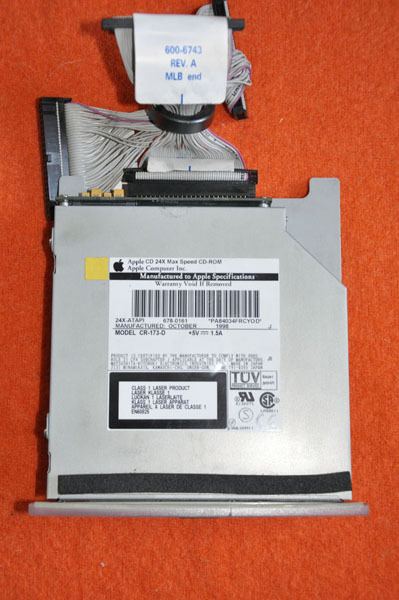 There is a CD ROM opening below the screen, but no sign of a processor box. It is in the base of the monitor. As it says on the screen it runs Mac OS X on a 350 MHz PowerPC G3 with a Memory of 128 MB SDRAM (Synchronous Dynamic Random Access Memory). SDRAM is synchronised with the processor clock and allows the memory module to handle multiple requests at once. 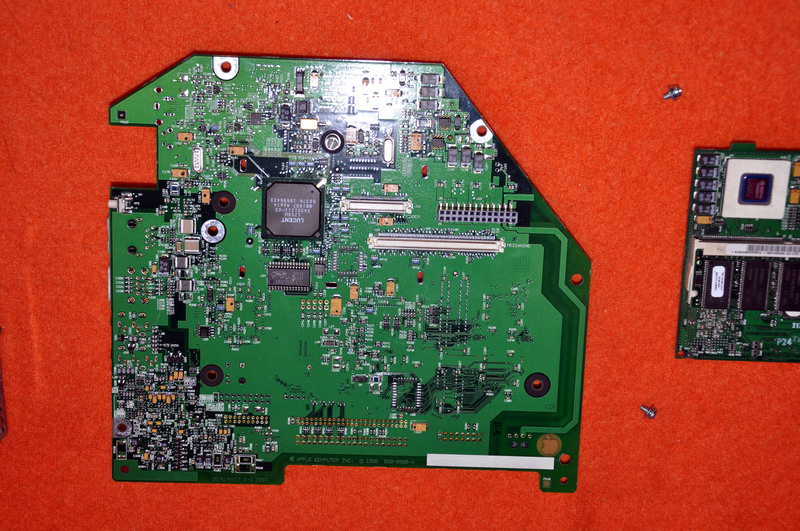 Opening a panel on the side reveals the connections to the G3. The first is a socket for audio input, then a socket for audio output. 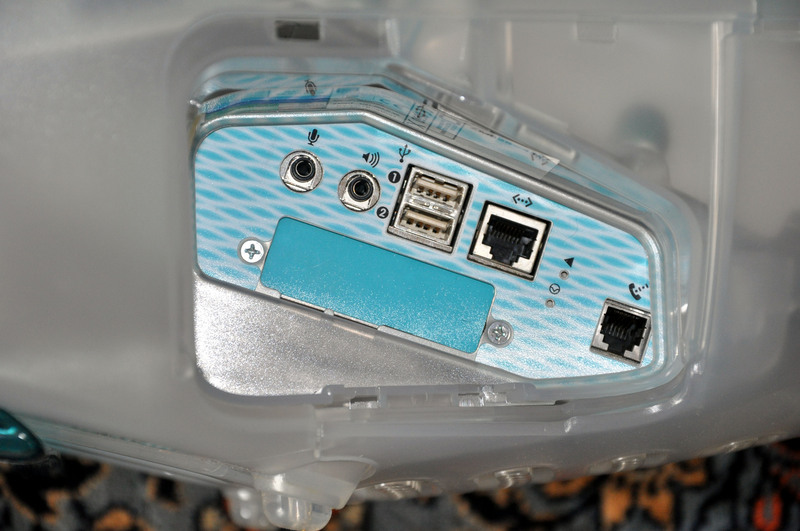 Next is two USB ports. Finally a telephone line socket, (there was a 56K built in modem). There were two headphone sockets on the front of the monitor. The keyboard connected to one of the two USB ports and the keyboard had two more USB sockets. The mouse is connected to one of them. This is an iMac G3 opened up. Just three screws released the base plate on the below right. Then four screws released the base unit at the bottom. above the mother board is the daughter board. 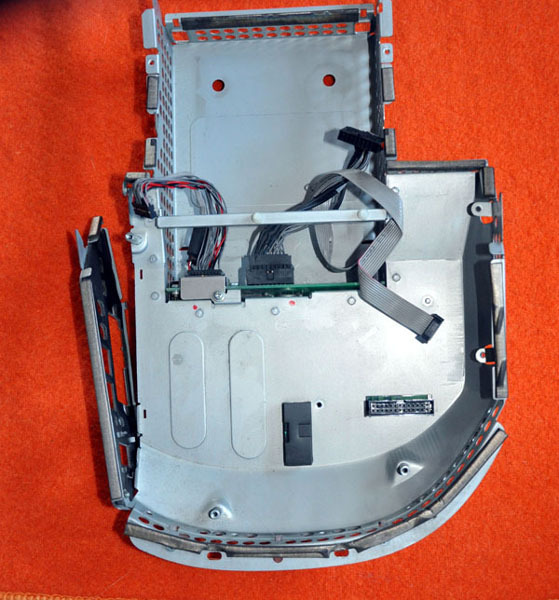 The base unit of the monitor was the computer. The first thing to remove was the Apple CD 24X Max Speed CD-ROM. MANUFACTURED OCTOBER 1998. 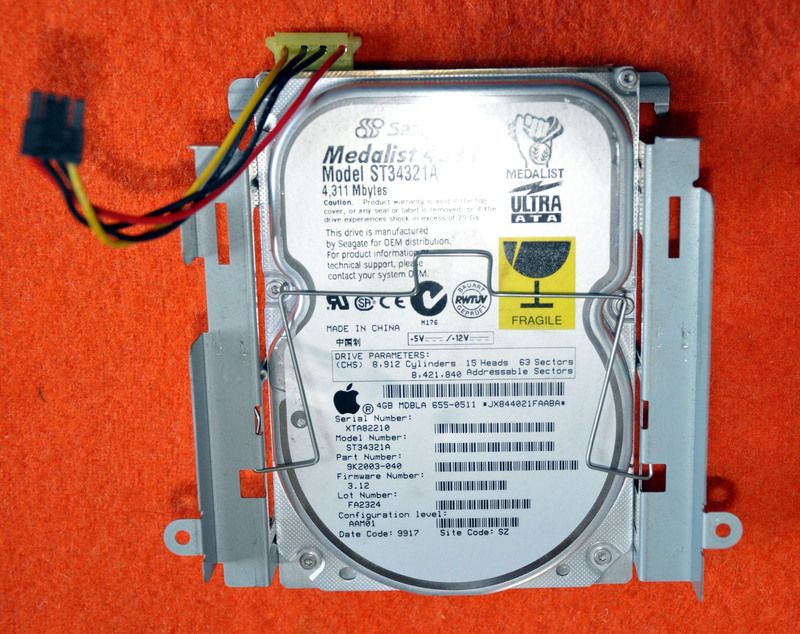 Next to remove was the hard disk drive, a Seagate Model ST34321A 4,311Mbytes. (That is 4.311GBytes) . Now we can get to the mother board. It is not really a mother board because it does not have the CPU on it. The CPU is on the daughter board which comes next. On the board is a big chip "RAGE PRO TURBO PCI 215R3PUA33" so this really is a graphics card. 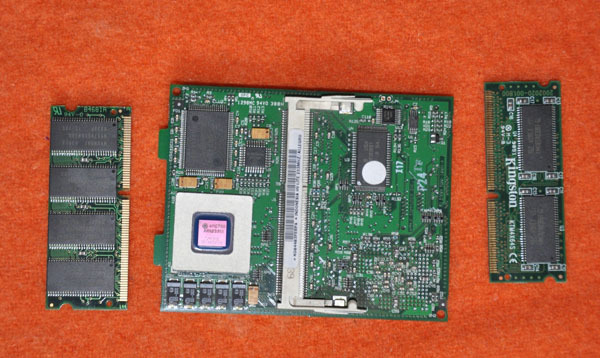 To the left of this is two chips KM4132G271B0-10 which are 4Mbits of Synchronous Graphics RAM. 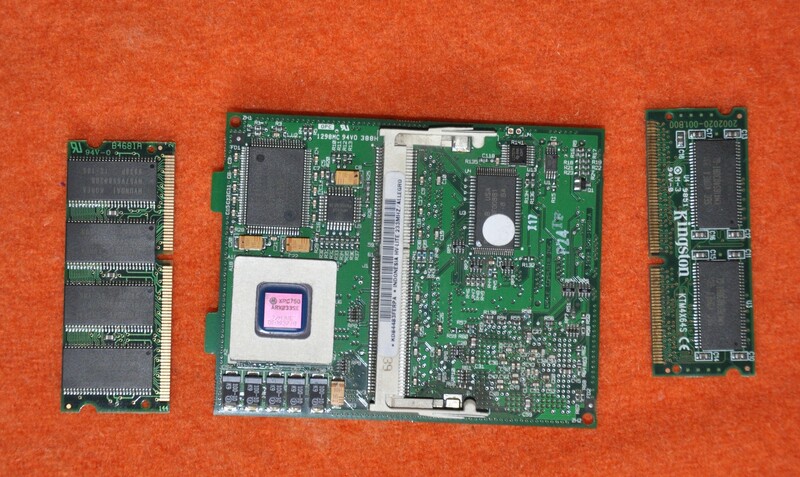 They are inside a socket that houses the memory module to the left which is another 4Mbits of Synchronous Graphics RAM. 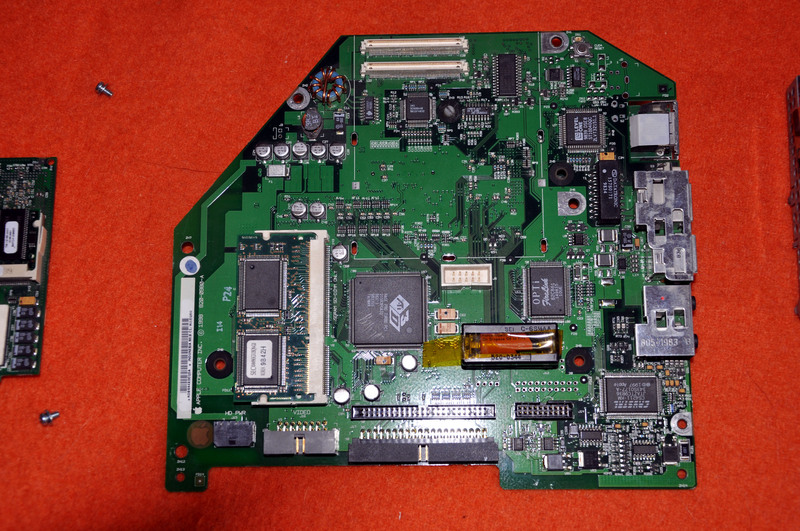 To the right of the graphics chip is an "OPTi FireLink 82C861" 100 pin chip, this supports two USB ports. The under side of the mother board. 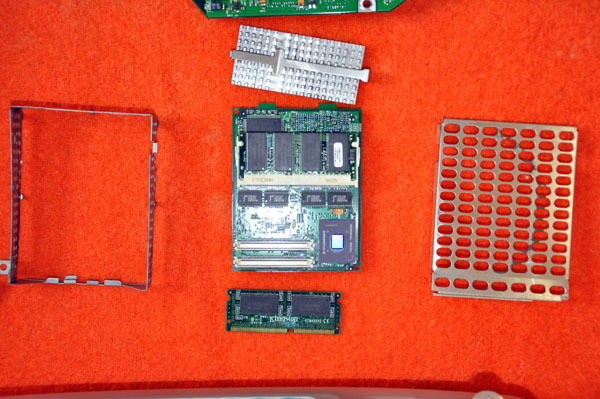 There is a mass of electronic components at the bottom left. I think they are to do with the AUDIO output. 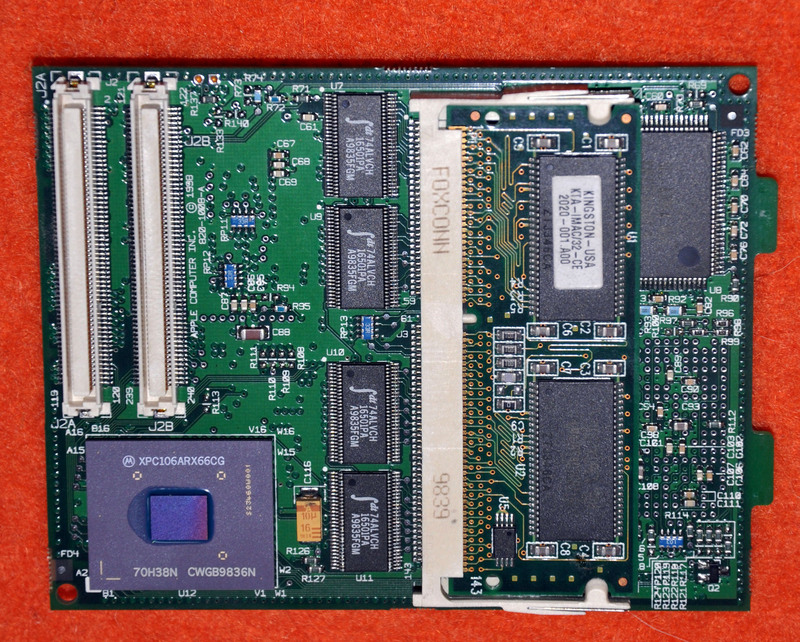 This is the daughter board containing CPU and the 32MByte RAM on a DIMM chip. The heat sink above clipped on to the frame around the daughter board. This is a closer view of the daughter board. The big chip bottom left labelled XPX106ARX66CG is a Motorolla 350MHz Power PC 750 CPU. This is the rear of the daughter board. 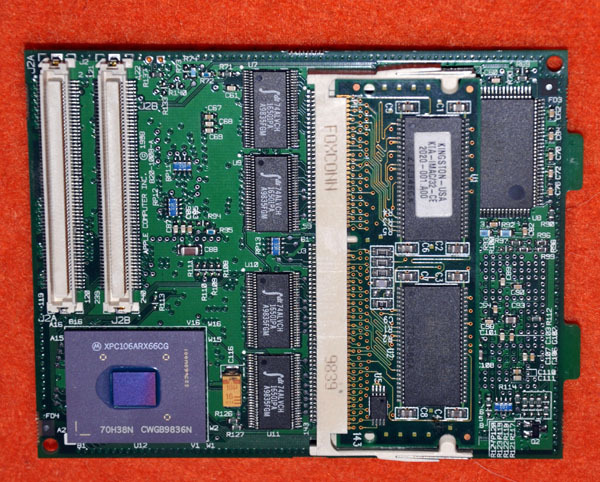 The big chip labelled XPC750 ARX233SE is 233MHz chip.